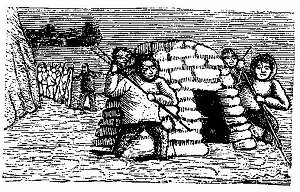 Inuit is the term preferred for speaking of the people commonly known as Eskimo—the word Eskimo being derived from a derogatory term (meaning "eaters of raw flesh") used by the Algonquin people of North America. The Inuit culture is possibly the most geographically extensive of all traditional lifeways, showing an astonishing homogeneity of language, beliefs, and technologies over more than 5000 miles of coastal territory extending from eastern Siberia to Greenland. Ethnologically, the Inuit are considered to be distinct from the other native inhabitants of the Americas, being more closely related to the Siberian peoples. Shamanism also plays a very large role in Inuit culture, with tales of shape-shifting and super-powerful angakut abounding. Includes ethnography and folklore of the Inuit.